If you read magazines and blogs regularly, the focus on activated charcoal couldn’t have bypassed you. It is ‘presented’ to us as the latest ‘must-have supplement’ but let me start this blog with a cautionary tale. In Russia activated charcoal has been used for years as a supplement to help flush toxins out of your body when you have food poisoning, drank too much or are feeling bloated due to indigestion. It is not something that you would take daily to ‘enhance’ your body’s detoxing and elimination process. I am not suggesting doing so would do you harm, but as with taking antibiotics when you don’t need them, taking a supplement because someone tells you it is good for you isn’t necessarily your call for action. When I saw a drink with activated charcoal that was launched a few months ago that you are supposed to drink post-workout, I questioned one of the brand’s founders face-to-face and was somewhat taken aback when I was told that he wanted to be the first to introduce it into the beverage, ahead of the competitors. Not a good argument for me to take something that really shouldn’t be taken daily and his words actually have put me off buying drinks from this particular brand, even though it is creative and innovative in many ways. However, I was quite intrigued by the product that was launched a few months ago by Sister & Co. Skin Food that is called Raw Coconut & Activated Charcoal Tooth Whitening Polish. Founded by a former lawyer Sophie Thompson, whose brand journey started with her own skin problems and evolved into launching a line of products that use coconut oil as its primary base ingredient. Lately I have also seen toothbrushes pop up at trade shows, both in London and Moscow, which are coated with ‘pure Silver, Gold and Bamboo Charcoal – this one is from a brand called Nano-B. I tend to use an electric toothbrush in the morning and a Nano-B in the evening and can exalt virtues of both. Somehow each compliments the other in my daily hygiene routine nicely. With its porous surface, activated charcoal attaches to plaque, tannins from wine or tea and coffee stains and helps to lift them off with regular use. 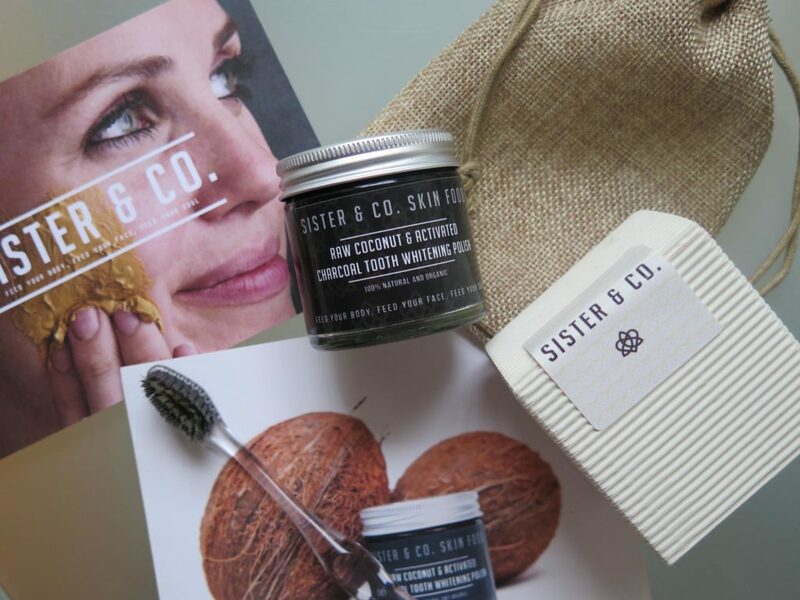 Sister & Co. teeth polish is made with premium finely ground food grade activated coconut charcoal, which isn’t abrasive, so can be used by those who have sensitive teeth as well. You will also find bentonite clay in the list of ingredients, which in this instance aids the charcoal’s work, absorbing heavy metals and delivering essential minerals, while organic peppermint and Australian lemon myrtle (citric acid free) soothe, help fight bacteria, reduce inflammation and add freshness to your breath. There are also Vitamin E and lauric acid in the Sister & Co. Coconut Oil base, which will nourish and strengthen gums (which tends to recede as we age), while contributing to the impurity removal process and whitening teeth’s appearance. I have been using this tooth polish nightly for a couple of months now and can say that my teeth do look marginally whiter. The polish also seems to contribute to keeping my teeth in good condition, alongside my Colgate toothpaste that I get from my dentist, which helps to look after my enamel & strengthen it. When I purchased the polish I wasn’t sure if it will be effective or not, but somehow I got into using it nightly and think it is a good natural teeth polish that contributes to my overall teeth and mouth hygiene. What’s more, the brand doesn’t make any sensational claims and in some ways allows you to go back to the roots of a good practise which probably existed in the past. Ingredients: Cocos nucifera (Coconut) Oil*, Bentonite, Activated carbon*, Mentha piperita (Peppermint) Leaf Oil*, Backhousia citriodora Leaf Oil*, Limonene** *organically produced ingrendient *natural constituent of essential oil. The polish does cost £26.95 for 60 mls, which is no cheap but the pot will last you a long time – I have been using mine nightly for two months or so and I probably only used a third of it, but that is the only potential ‘negative’ that I can mention here. I am not a 100% sure about the claims that some toothbrush makers make, when it comes to ‘coating’ brush bristles with silver, gold or charcoal but I can say that from my own experience I do enjoy using one of those brushes as much as I do brushing with my Sonicare. As to making the judgement on whether brushing your teeth with charcoal coated bristles is more effective than with a regular or electronic toothbrush, I can’t and won’t make one, as I am not a dentist nor hygienist but I can say that my teeth feel ‘clean’ and look a shade brighter. Maybe combining tried and tested practises of the past with modern technology advances is the best way forward ? It’s one of those intriguing products with the black colour. So you were using it alongside toothpaste, I wonder how effective it is used as toothpaste on its own? “New” trends are fascinating as they are ALWAYS rooted in ancient practices. I remember as a child when I stayed with my grandparents I used chewing sticks for teeth cleaning, I wonder how long before that becomes new here! Yes, I was using the charcoal toothpaste ( every evening ) alongside my regular Finnish toothpaste that is non-whitening. I also wonted to compare the hygienic effect of charcoal & coconut toothpaste compared to the ‘regular’ one.